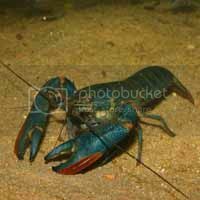 General information: This is the more common species of yabby in the Northern Territory, found in most northern rivers. It is particularly common in the Howard and Adelaide Rivers. 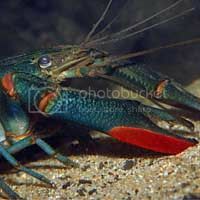 This yabby was trialled as an aquaculture subject in the NT but it is mostly not used any more as the farms went onto other ventures. The features that made it suitable for aquaculture and the aquarium are its ability to withstand low oxygen levels and warm water associated with the tropics. In the real world they are opportunistic omnivores eating vegetable material, wood and leaves, and anything else small they can catch. They live among the vegetation and woody structures in the shallower areas. In the wet season they venture out of the river into the flooded shallows where they can be found in the shallow water among the grasses. The third photo from the left is a young specimen that has not matured. The other three photos are of a large 180mm specimen from the Reynolds River in the NT. 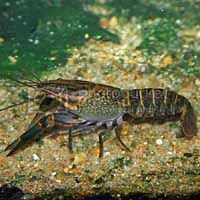 Cultivation notes: Best kept in an aquarium of 60cm or larger with plenty of structure for hiding places so they can get away from each other especially during times when they are moulting. 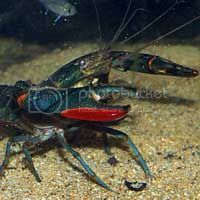 These yabbies are generally more placid than their southern cousin the common yabby, they are omnivores but tend to eat more vegetable material and are thus not suitable to use in a planted aquarium unless you want all the plants snipped off at the base. They dont seem to be as good at catching fish as the common southern Cherax destructor. Water quality at Aquagreen where they are cultured is temp from about 20 to 32, hardness from 50 ppm to 100 ppm, carbonate hardness from about 60 ppm to 110 ppm. The culture ponds are fertilised to promote plankton growth and fed an aquaculture pellets. In the aquarium they will accept most prepared foods fed to omniverous fishes. If kept through successive generations lighter specimens can be selected and eventually after a few years pale blue and white specimens can be bred. Distribution: Northern NT and far North Qld.